The durable Toyota range of 3 and 4-wheel electric counterbalanced trucks are suitable for a variety of indoor and outdoor operations, including loading and unloading goods, line feeding, stacking, order picking and horizontal transport. With a battery choice between 48 and 80 volts, and load capacities ranging from 1.0 to 3.5 tons, our electric forklifts offer high performance. 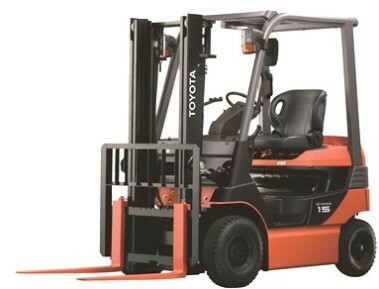 Each counterbalanced forklift model is equipped with the unique Toyota System of Active Stability (Toyota SAS) and AC motors to enhance driver safety and productivity. 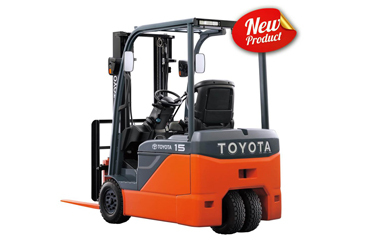 The Toyota 8FB range of 4-wheel forklifts is designed for light, medium and heavy load weights and applications. The 8FB range’s compact dimensions also ensure that these forklifts can navigate in tight production areas and can stack products in storage systems with narrow operating aisles. The trucks are flexible enough for both indoor and outdoor use. 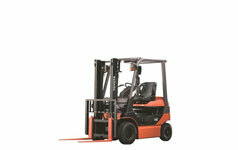 The new Toyota 8FBE-Series of 3-wheeler forklifts offer load capacities from 1.0 to 2.0 tonnes. Its compact design and even shorter turning radius ensures easy manoeuvrability in tight areas. Equipped with unique Toyota SAS features, our 3-wheel fork truck models are designed to be class-leading in safety and productivity, whilst protecting the driver and being best in class in energy efficiency.